This beautiful Disney princess birthday cake was created for a one of a kind princess. The cake design was carefully planned side by side with the customer to ensure they would be pleased with the final outcome. Their first thought was to have us create a barbie princess cake, but they realized their daughter also loved Disney's beauty and the beast birthday cakes. So we combined both ideas to create a custom pink Disney themed cake. The pink tiara on top is the perfect cake topper for this princess cake and its make from completely edible frosting. 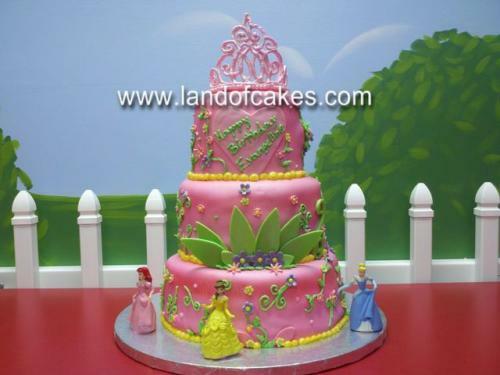 Whether its a one-of-a-kind kids first birthday or a special sweet 16 birthday party, for your next occasion let us create one of our custom Disney princess birthday cakes. For a great tasting cake, and a personal touch order your next cake from land of cakes New York.